Laughter lines the faces of camp staff as they prepare for a sing-song. 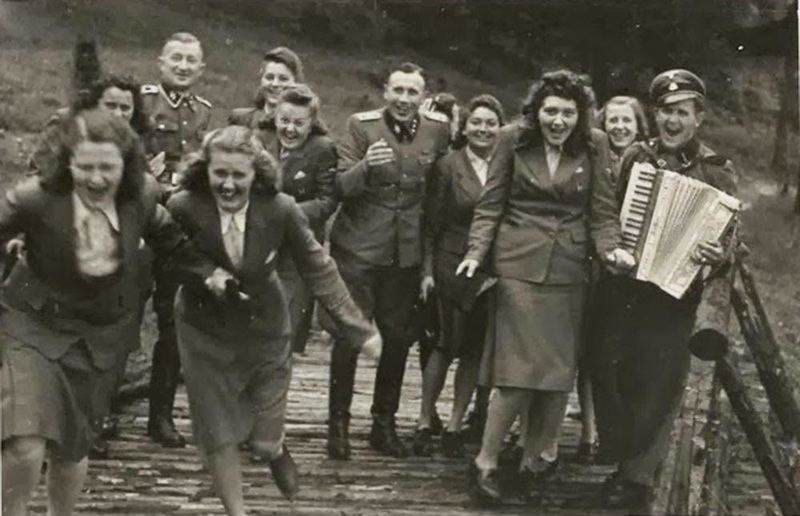 The photos were taken between May and December 1944, and they show the officers and guards of the Auschwitz relaxing and enjoying themselves — as countless people were being murdered and cremated at the nearby death camp. 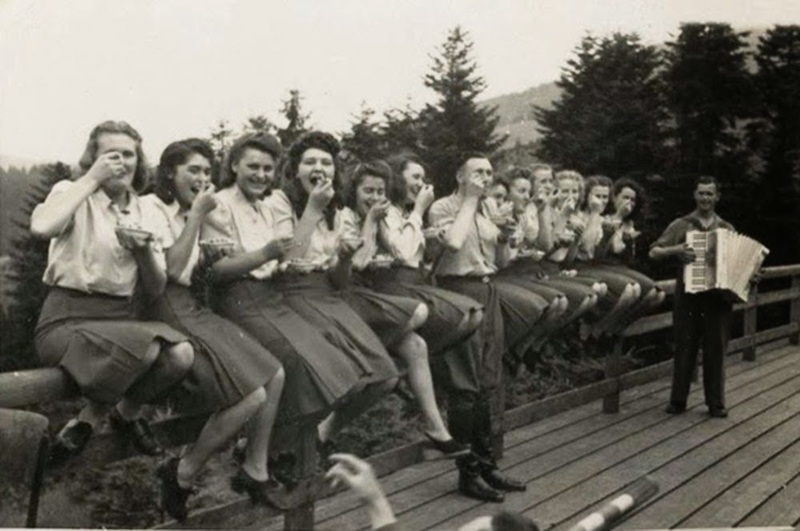 In some of the photos, SS officers can be seen singing. In others they are hunting and in another a man can be seen decorating a Christmas tree in what could only be described as a holiday in hell. 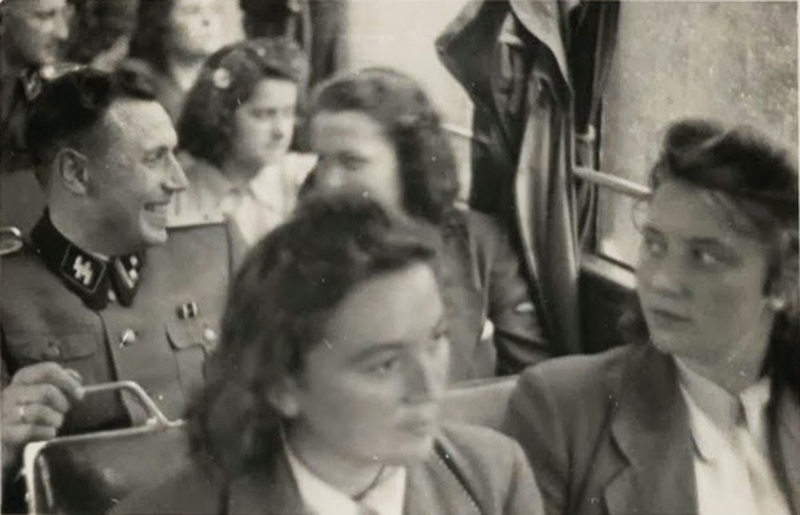 The album also contains eight photos of Josef Mengele — some of the very few existing snapshots taken of the concentration camp’s notorious doctor during the time he spent there. 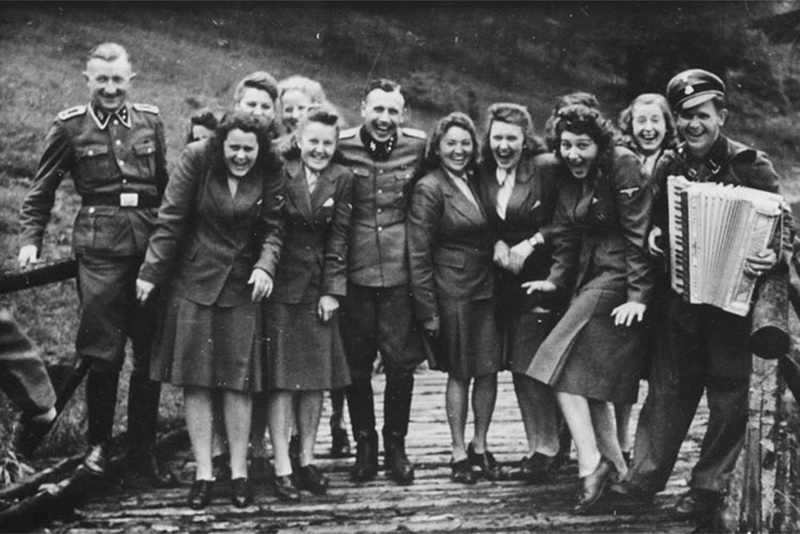 The images are significant because there are few photos available today of the “social life” of the SS officers who were responsible for the mass murder at Auschwitz. These are the first leisure time photos of the concentration camp’s SS officers to be discovered, though similar images do exist for other camps, including Sachsenhausen, Dachau and Buchenwald. 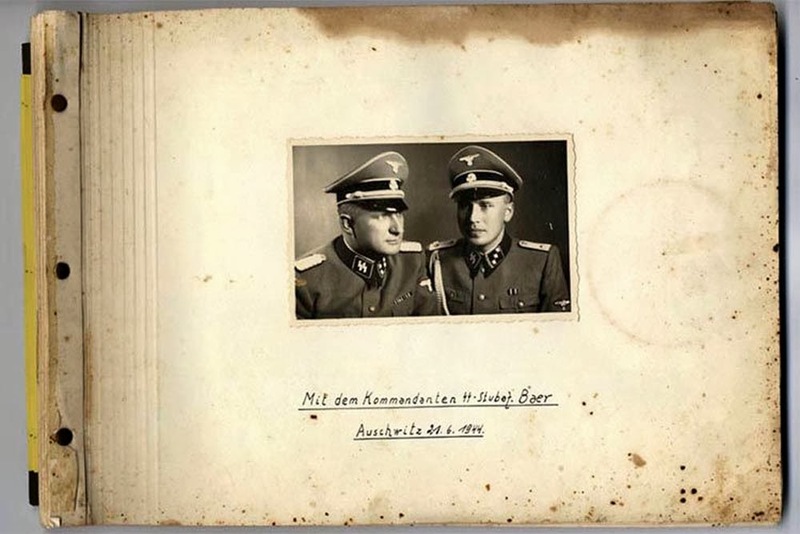 The album belonged to Karl Höcker, the adjutant to the final camp commandant at Auschwitz, Richard Baer. Höcker took the pictures as personal keepsakes. Prior to its liberation by the Allies, Höcker fled Auschwitz. After the war, he worked for years, unrecognized, in a bank. But in 1963 he was forced to answer to charges for his role at Auschwitz at a trial in Frankfurt. In his closing words in the trial, Höcker claimed: “I had no possibility in any way to influence the events and I neither wanted them to happen nor took part in them. I didn’t harm anyone and no one died at Auschwitz because of me”. In the end, though, he was convicted on charges of aiding and abetting the murders of 1,000 Jews and was sentenced to seven years in prison. He was released after serving five years. In 2000, he died at the age of 88. The photos were made public by the United States National Holocaust Museum in Washington. The museum obtained the photos from a retired US Army intelligence officer, who came across the album in an apartment in Frankfurt and has now given them to the museum. “These unique photographs vividly illustrate the contented world they enjoyed while overseeing a world of unimaginable suffering”, museum director Sara Bloomfield said in a statement. “They offer an important perspective on the psychology of those perpetrating genocide”. The director of the museum’s photographic reference collection, Judith Cohen, said there are no photos depicting anything abhorrent, “and that’s precisely what makes them so horrible”. This first page shows Hoecker, right, with the commandant Richard Baer. 1944. Helferinnen, in wool skirts and cotton blouses, listen to the accordion and eat blueberries, which Karl Hoecker had served to them. 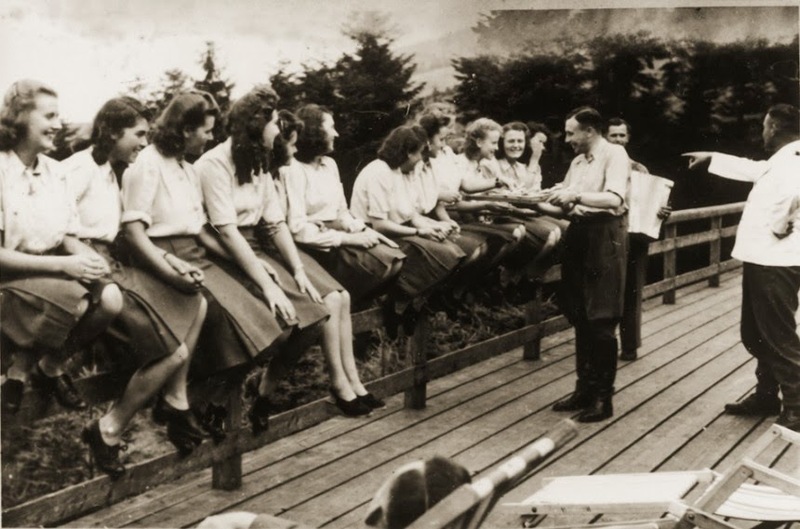 Twelve SS auxiliaries sit happily on a fence railing eating blueberries given to them by an SS officer. Later in this series of photographs, “the women and the officer turn their bowls to the camera; some invert them to show that they are empty,” Wilkinson writes. “One woman pretends to weep. The scene took place on July 22, 1944. On July 23rd the Soviets liberated Majdanek, the first concentration camp to fall. Majdanek was about a hundred and eighty miles northeast of Auschwitz. When the camp was abandoned, a thousand prisoners were force-marched to Auschwitz. Only half of them arrived. Officers and Helferinnen at Solahütte. “In a series of photographs, the women and three officers run toward the camera, grinning wildly, apparently because it has suddenly begun to rain,” Wilkinson writes. Karl Hoecker en route to or returning from Solahütte. Taking a break. The second person is the notorious concentration camp doctor Josef Mengele (The Angel of the Death). 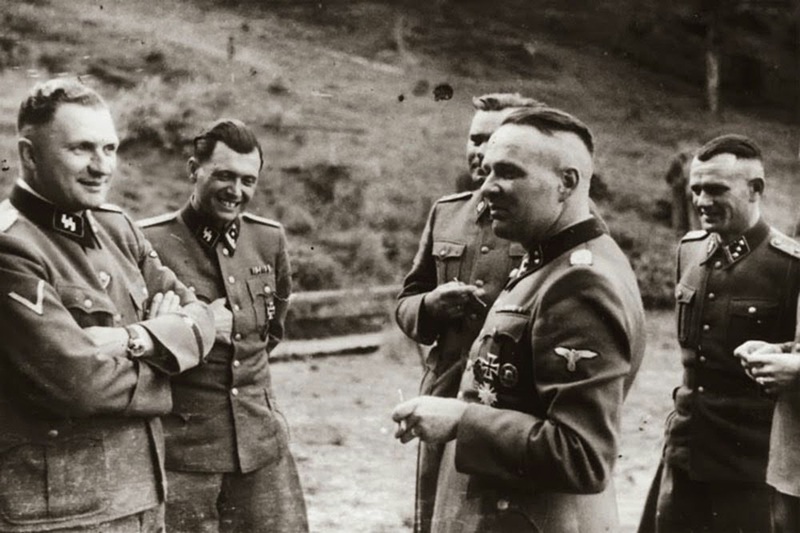 Camp commandant Richard Baer, notorious concentration camp doctor Josef Mengele (The Angel of the Death), and the commandant of the Birkenau camp, Josef Kramer (obscured) and former commandant Rudolf Höss. 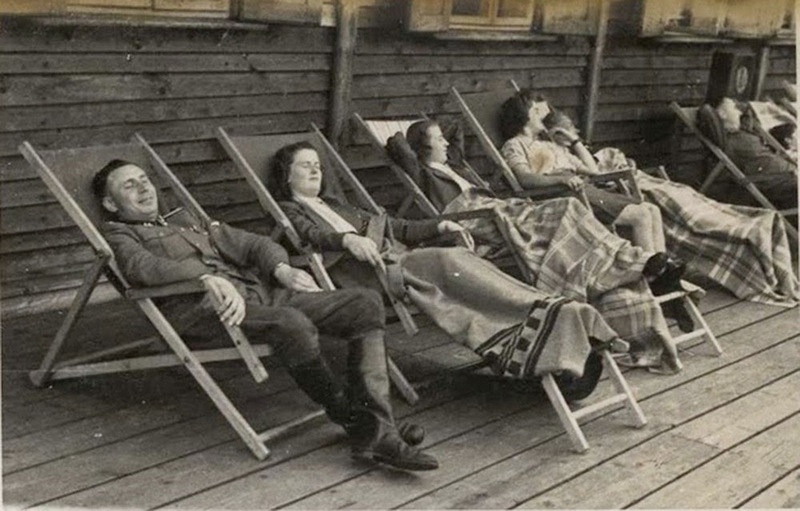 SS officers relax on the grounds of the Solahütte retreat. 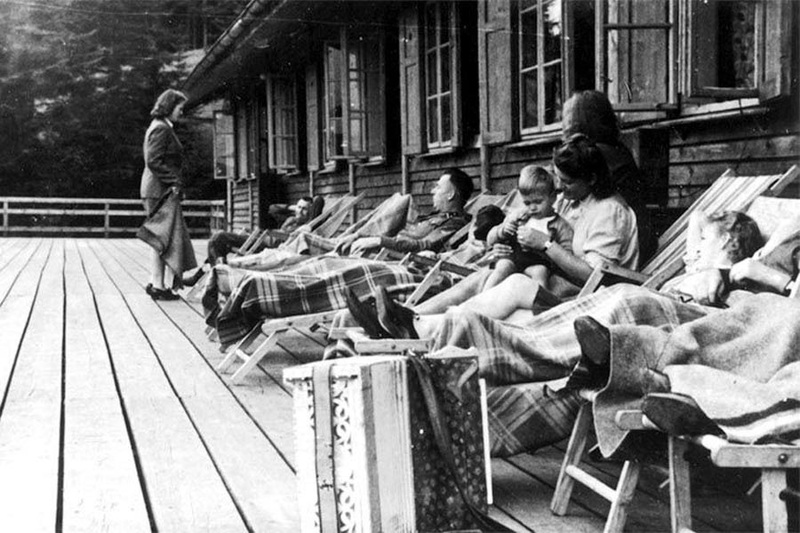 SS officers relax together with women and a baby on a deck at Solahütte. As the SS members took time off, hundreds were being exterminated nearby at Auschwitz. Resting at the Solahütte retreat center. 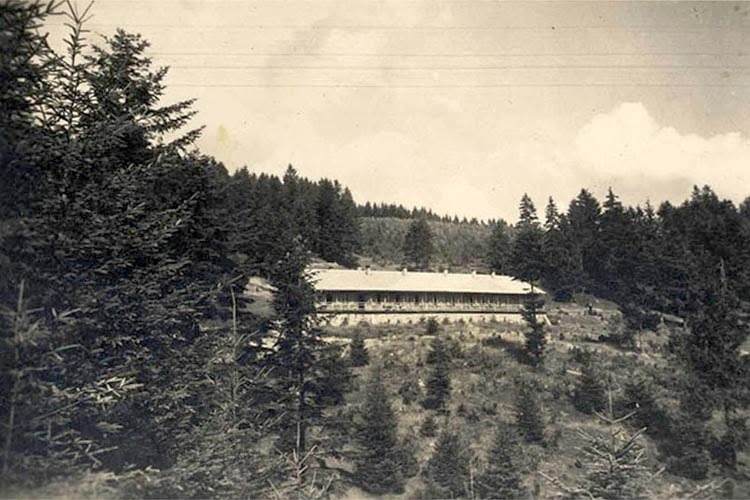 The Solahütte retreat was used to provide a relaxing atmosphere for SS officers working at the Nazi death camp at Auschwitz. Singing to release the stress: an accordianist leads a sing-along for SS officers. 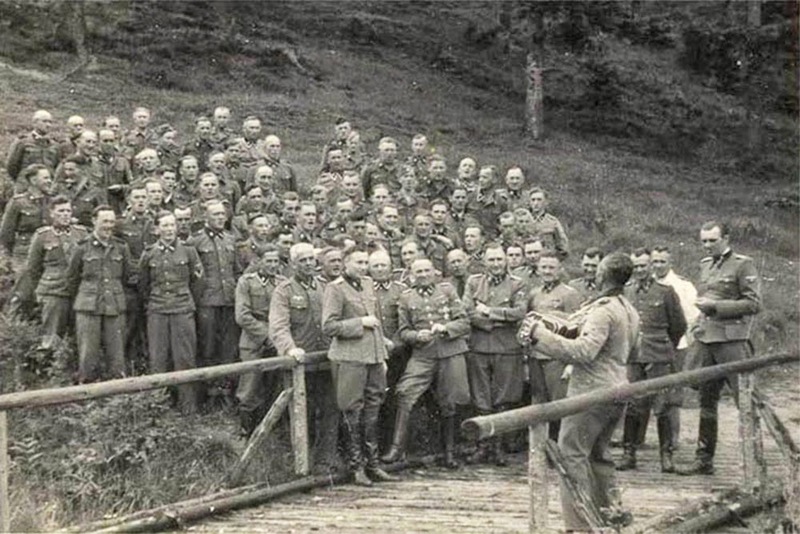 This photograph, taken at Auschwitz, shows “nearly a hundred officers arrayed like a glee club up the side of a hill. The accordion player stands across the road,” Wilkinson writes. “All the men are singing except those in the very front, who perhaps feel too important for it.” The group includes Richard Baer; Rudolf Hoess, who had supervised the building of Auschwitz and had been its first commandant; and Josef Mengele, the doctor who performed infamous medical experiments on twins and other prisoners. 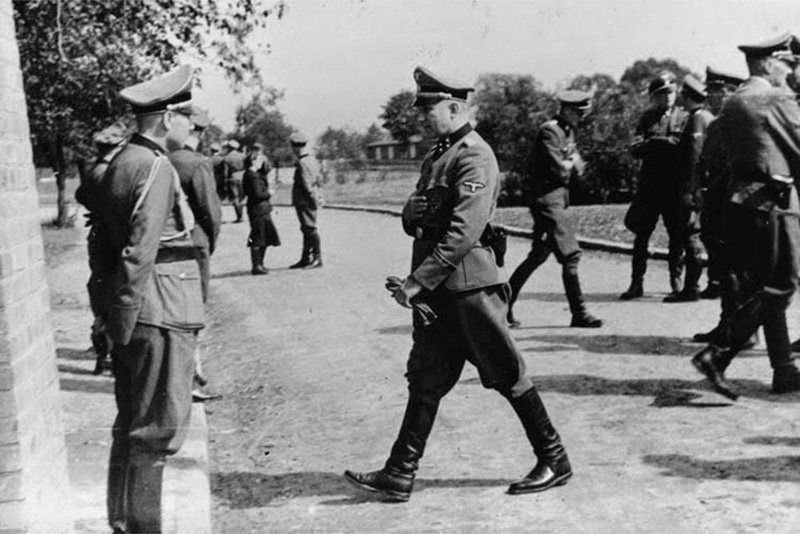 This album contains eight pictures of Mengele—the only known photographs of him at Auschwitz. 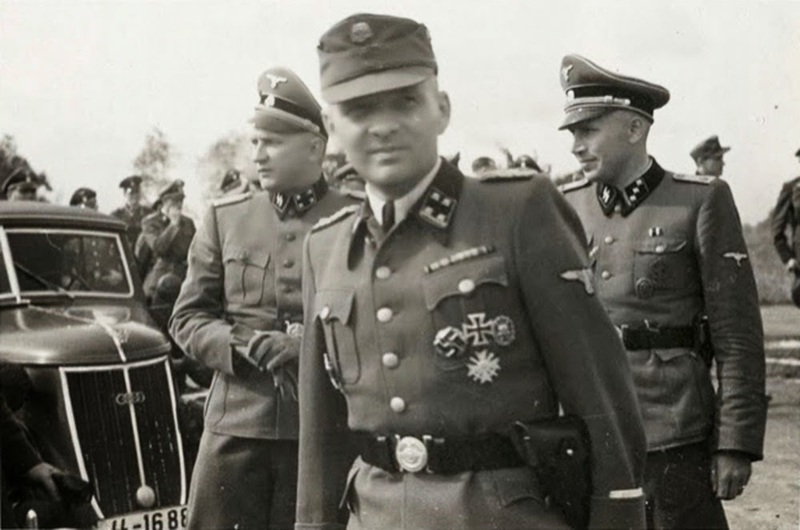 A group photo of the mass murderers of Auschwitz: Josef Kramer, Josef Mengele, Richard Baer, Karl Höcker (from left; man at right unidentified). 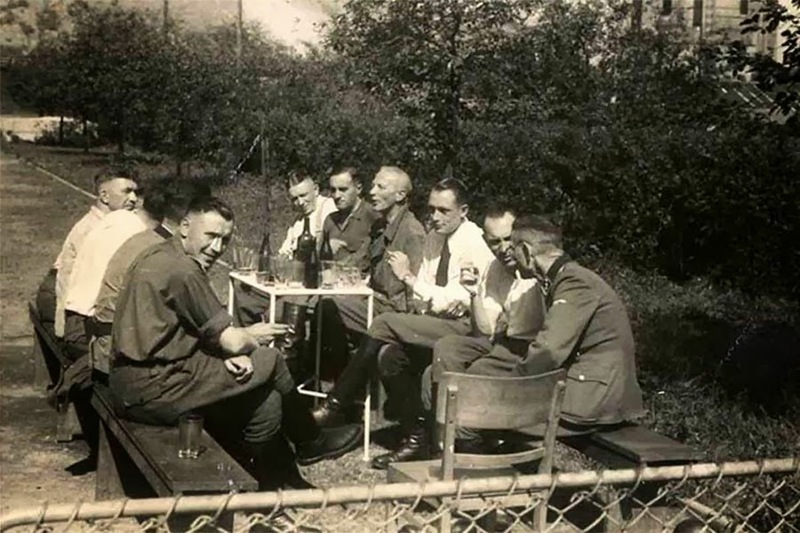 Finding comfort at Auschwitz: SS officers drink together. 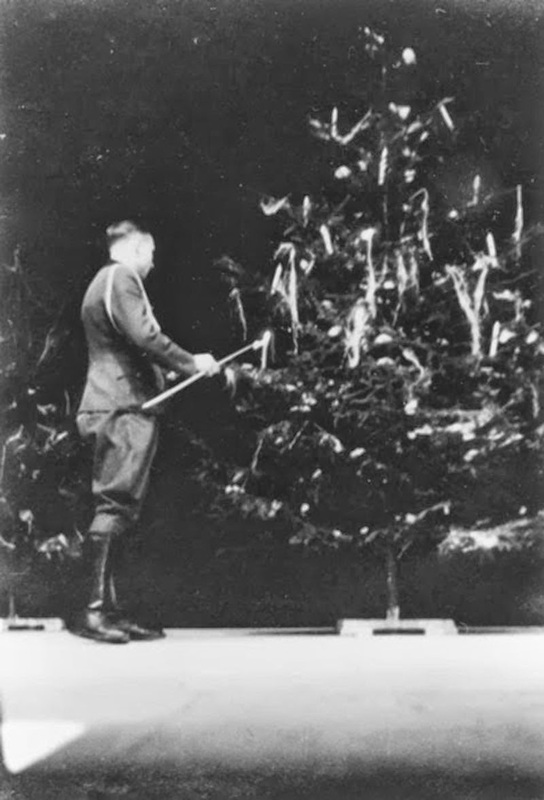 Christmas 1944: Karl Höcker lights the candles of a Christmas tree. “Hoecker was born in Engerhausen, Germany, in December, 1911, the youngest child of six. His father, a bricklayer, died in the First World War, leaving his family impoverished. Hoecker worked at a bank, then joined the SS in 1933. At the beginning of the war, he was drafted into the SS Fighting Corps, and in 1940 he was sent to work at Neuengamme concentration camp, near Hamburg. In 1942, he was transferred to Majdanek, where he was adjutant during the Harvest Festival of November, 1943, when all the Jews from three camps, including Majdanek, were assembled and shot, in order to prevent uprisings. Forty-two thousand prisoners were killed in two days”. 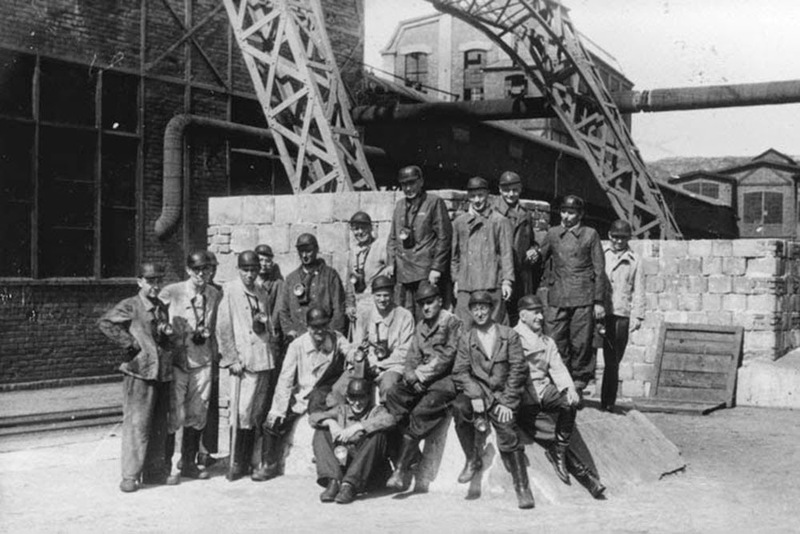 A large group of SS officers visit a coal mine near Auschwitz. 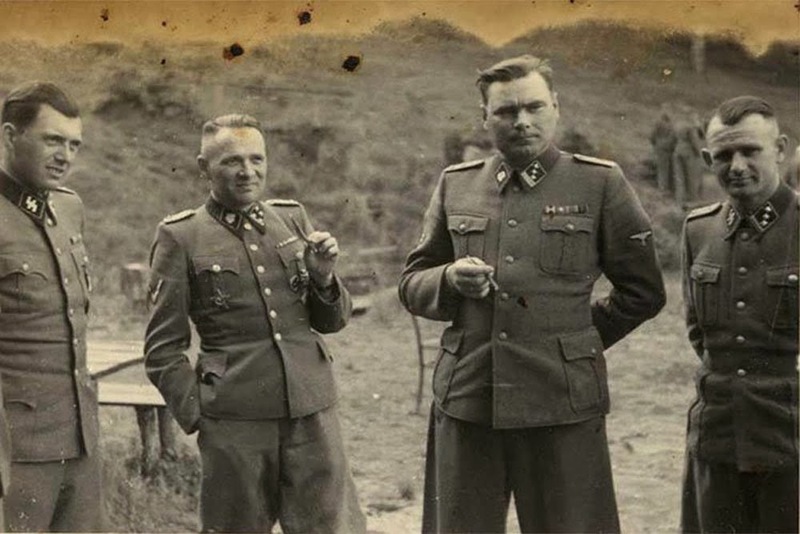 Karl Hoecker (right) with Richard Baer and Rudolf Hoess. “Rudolf Hoess, in ‘Death Dealer,’ a memoir he wrote after his arrest, noted that the adjutant ‘has a special position of trust. He must insure that no important event in the camp remains unknown to the Commandant”, Wilkinson writes. 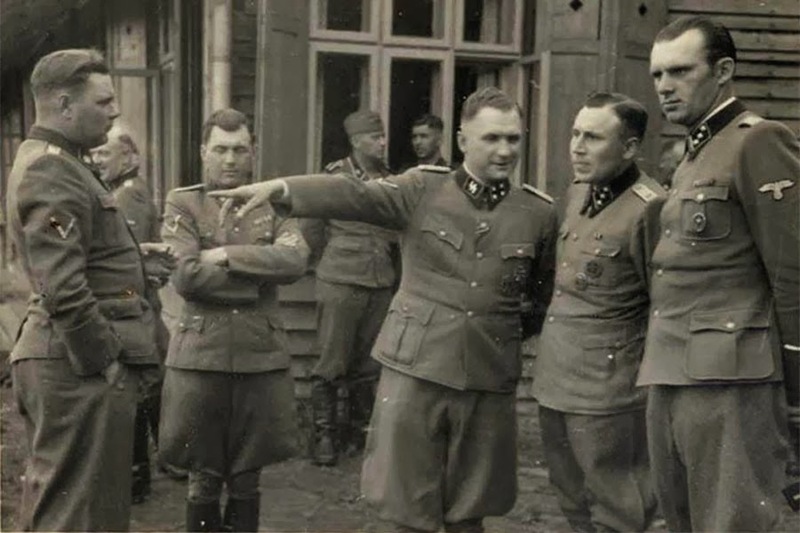 “A few days before Soviet troops liberated Auschwitz, in January, 1945, Hoecker and Baer fled to Germany, where Baer was made commandant of the Dora-Mittelbau camp, and Hoecker was again his adjutant. When that camp was liberated by American troops, in April, Hoecker and Baer followed the advice of Heinrich Himmler, the head of the SS, which was that SS officers insinuate themselves among the troops, in the hope of being taken for ordinary soldiers. Hoecker joined a fighting unit that was captured by the British in northern Germany. He spent a year and a half in a POW camp, and was released, apparently because no one recognized him”. The opening of a hospital at Auschwitz. The “small, chubby, bald man wearing a suit”, Wilkinson writes, “is Carl Clauberg, a doctor who performed sterilization experiments on women, using acid. He was tried by the Soviets, in 1948, and sentenced to twenty-five years in prison. He was released early and arrested again, by the Germans; he died in 1957, awaiting his second trial”. SS officers gather for the dedication ceremonies of the new SS hospital. 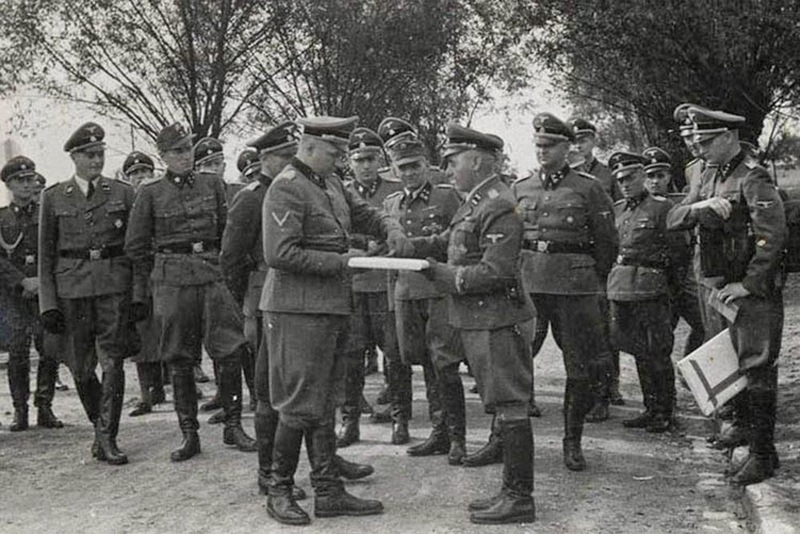 SS officers gathered at the same event. Hoecker, lying on a wooden platform about the height of a table, shoots a rifle. 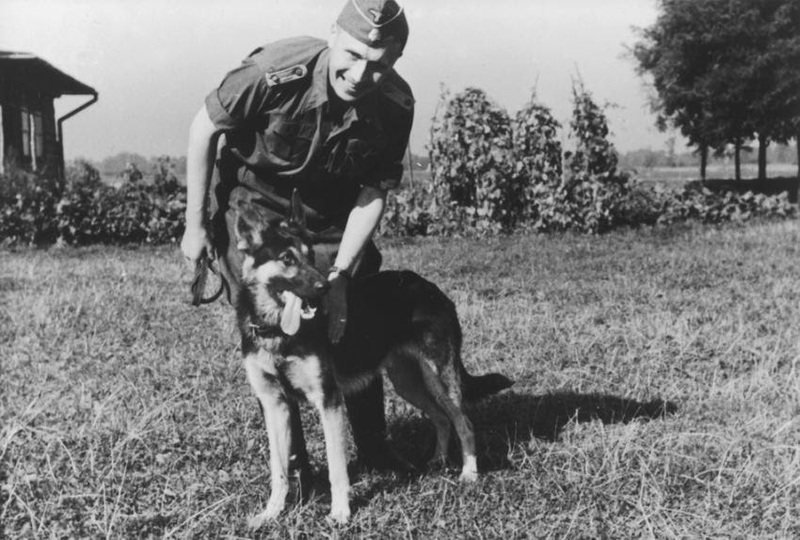 Right: Hoecker in his summer uniform. Hoecker in his summer uniform — “a little wilted, his sleeves rolled”, Wilkinson writes. After the war, Hoecker went back to his bank job. But “in 1952, he turned himself in for having belonged to the SS”, Wilkinson writes. He was sentenced to nine months that he never served. Hoecker was tried again in 1963 at the Frankfurt Auschwitz trials, found guilty of “aiding and abetting the death of a thousand people on four occasions,” and received a seven-year sentence—but escaped more serious charges because he insisted that he had never been on the selection ramp where prisoners were divided between work duty and the gas chambers. He served part of his sentence, “was paroled in 1970, returned again to his job at the bank, and died, at eighty-nine, in 2000”. That is Rare and Amazing! Much like the so called Kurt Franz album, photo graphic evidence of nothing, is evidence of something, just because someone says so. Incredible. It shows these mass murderers of innocent human beings were unaffected by their murders. Even more incredible is the existence of deniers, despite the overwhelming mountains of photographic evidence and the countless eyewitness accounts of former prisoners and their liberators. It's truly amazing that deniers can live in such a bubble! Even more incredible that you are still going on about it after 70 years. Those 6 millions you claim died are nothing to me, I was neither alive during that time period nor were these people family to me no matter how remote. If I want to get upset then I have to consider the 60 million(!) dead of World War II and the 20 million alone that died during the great famine that was purposefully caused by western financed communists in Ukraine. Oh boy another brainwashed Russian. Tell me again how Stalin was financed by the west? You are so Brainless to say this .. It doesnt matter if you were Alive or not . Its shameless what you wrote . One of the most horrific massmurder in human history. We should never forget this and keep remembering all Those victims. Vasliy, only psychopaths and sociopaths cannot feel the pain of what "others" suffered, so please get mental health help. It could be you next. If it's illegal to investigate the Holocaust™ in the first place then nobody should be required to believe it. The thing about history is, it can easily repeat itself. Keep these things in your mind so you can see the pattern and stop it from happening. Remember that there are still a lot of psychopaths in positions of power who would love to do this again. The smiling 'monsters' of Auschwitz who feel no empathy for the innocent victims of supremacism are posting in this forum. I wish we could post the photos of Kurt and and Vasily as well to show the world the smiling face of today's potential sociopaths who, if given the opportunity, would have the moral ability to work at a new Auschwitz! So much out of context. You're ignorant scum. Nice argument there rapidron, it's sure worthy of merit. The first quote is my favorite. A Jewish prisoner of the Germans in a camp in Poland in 1938? Poland was not invaded until 1939. That is what we call a "made up fact". Good job on you for posting that as "evidence". "The earth is flat. Everybody knows this. The 'round earth' industry wants you to think it is round because that is how they make money". Don't ask where I found this quote. It is true until you prove otherwise. Who posed for all those pictures dead or alive in the camps?Check with the U.S. soldiers who liberated the different camps.In Holland from the 120.000 Jews living there prior to the invasion,omly 20.000 came back,Where did they go? Visit a few camps in Poland or Germany,or the collection camp in Holland [Westerbork].,from there they went to the different concentration camps. kamps..
Urge you to correct your description terms of Auschwitz as a "concentration camp" to that of a mass murder, extermination or death camp, which also had slave labor concentration-death camp sections. The use of concentration camp to describe the Nazi death - mass murder camps in Poland (e.g. Auschwitz-Birkenau, Sobibor, Treblinka, Belzec, Majdanek et al) is loved by professional Holocaust deniers as they like to claim that there were no gassings, no systematic murder of Jewish (or Romany & Sinti or other prisoners) and that the Nazi camps can be compared to contemporary camps housing war refugees from conflict zones and/or the internment camps where mainland Japanese-Americans were interned in the U.S. during WWII. However ugly, discriminatory and illegal were those latter camps, they were not killing centers. The analogy is incorrect and a falsification of history. Thanks. PS some of the comments posted above, by Jew-haters, show the depth of human depravity and sickness. There were 10 million murdered by the Nazis and Fascists in Europe during WWII. They are not forgotten. agree with everything you say. My entire family was taken to Auschwitz, including my mom, 18 at the time, her brother 12 at the time, and thrown in the gas chamber immediately, her mom and dad, aunts, uncles, cousins. My dad's family also. Thank you for your clarification, the only thing I would add is that all concentration camps were designed to kill. That was the master plan.. They were all designed to kill ALL Jews, all homosexuals, gypsy's, and the disabled. Plain and simple- the deniers might try all they want, but a genocide and organized depraved plan of that level has too much documentation. Those involved do not and did not deny it. Let them laugh- when they meet their maker, what will they say. Been to both camps madonek and aushiwitz amazing to imagine as bad a madonek was, (the shoes, all the baby shoes) that they could march that far to something completely different and beyond comprehension of even those in madonek... Worse!! See, this is what happens when you smoke meth while pregnant. Thanks for giving us even more proof abortion is a good thing. Right, I'm sure your ancestors or countrymen never took anything, land or otherwise, from others. There is absolutely no way you're currently benefiting from someone's misery or effort, and I'm sure if you became aware of such an injustice you'd give the shirt off your back to make it right, even if said injustice happened centuries ago. I trust that you're that sort of person. I know this is going to be hard for you Adolf, but please try and grow up. I'd ask you to grow a brain, but that would be asking the impossible. I pity the pathetic life you lead and i especially pity your friends.... if you have any. I can not believe that some people still to this day, say that the Holicaust never happened and that it was all just made up to fill people's minds with false atrocities that the SS committed during the war. The fact that people still exists that believe that such terrible acts did not happen is beyond the scope of the human mind. Perhaps these people should be subjected to some of the horrible conditions all those lost souls suffered during that terrible war by the unhuman SS Nazi officers, but then again, perhaps those that believe these horrible things didn't happen aren't human their self. Have any of the women ever been identified? One can easily take photos of soldiers anywhere on the planet having time off and put them among writings of supposed atrocities. It surely doesn't prove anyone reveled in murder or that there were murders at all. This is propaganda at its best. The story of the holocaust was initiated by the undeniable jewish led Soviet Union and there are countless fabrications and repetitions of outright lies designed to indoctrinate the world. I was caught up in this story and felt enormous amounts of sympathy for jews and hatred for Nazis. It was a spell I am no longer under. The only evidence of gassing of mass amounts of jews are "eyewitness" testimony and coerced confessions from tortured Germans. The Auschwitz "gas chambers" were constructed post war by the undeniable jewish led Soviets and the 6 million number was a fabrication repeated since the 18th century. Even though the 6 million figure had been vastly reduced by most, it is still repeated today, ad nauseum. The Red Cross reported there were 300,000 total deaths in German prison camps and just over half of these deaths were jews. This included all deaths, from old age to typhus (majority). As for the so called "eyewitness" accounts, there are gross contradictions for even those who are proponents for the holocaust story, not to mention there are many accounts by jews of the conditions at Auschwitz that were favorable, including a pool, a theater and their own currency. The holocaust story was an historic lie and persists today with the countless movies dedicated to the propaganda. In Germany, test this out by questioning anything about the so called holocaust. Red Cross: The numbers were originally from a Swiss tabloid called, "Die Tat" and the numbers represent the amount of Germans and German Jews. And that ICRC has denied releasing such numbers. Voltaire: The quote you used to give your arguments some legitimacy is not actually from Voltaire, but from a holocaust denying, neo-Nazi, named Kevin Alfred Strom. German Law: Holocaust denial falls under Volksverhetzung ( incitement of the masses), basically hate speech as it doesn't seem to mention the Holocaust specifically. My thoughts is that Germany wants to redeem itself by cracking down hard on these people. jewish led Soviets: No opinion. Don't know enough about that, the first few sites are anti-jewish sites and I'm tired of wading through muck. Though I will say "Institute for Historical Review" is pretty snazzy name. I lol'd. They show the gas chambers and dozens of corpses in Night and Fog. It's pretty graphic if anyone is going to take a look. Skeletal corpses of people being 'bulldozed' level of graphic. There are no photos of actual gas chambers used for homicidal purposes. Only photos of delousing chambers have been shown. The Germans used zyclon b to kill lice, not humans. The "gas chamber" at Auschwitz has been proven to be a postwar construction. Watch Cole in Auschwitz on YouTube, then watch the great holocaust trial. See what it's like when holocaust survivors get cross examined in a court of law. Also, testimony in that trial proves its impossible zyclon b was used as described. As for the bulldozers, those were British bulldozers and not German. 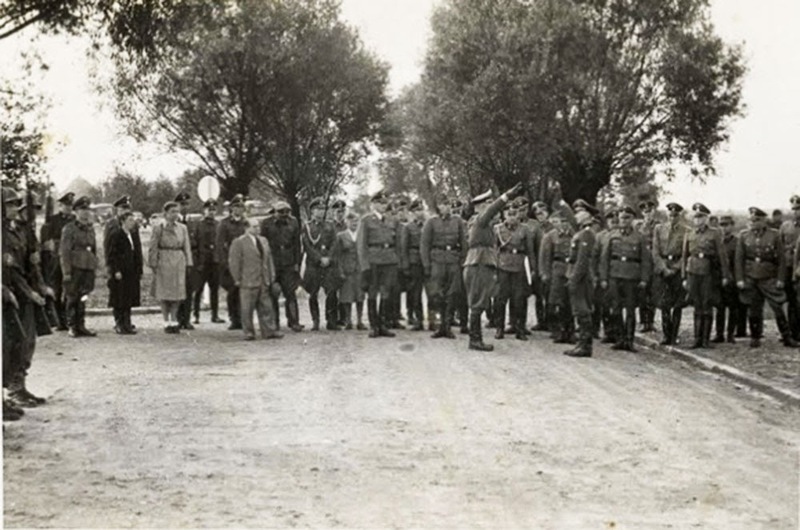 When the Germans evacuated the camps in the east, many of those prisoners CHOSE to leave with them to the west. So when you have a camp designed to hold 3,000 and is now holding 30,000, in addition to the allies bombing Germany's infrastructure and transports into oblivion, people are going to start rapidly dying. If they can't get more food and medicine due to bombing, of course prisoners starve and die rapidly. Everyone did. Pure propoganda at its best. Such is shrunken heads, lampshades, Jews into soap, a bear used to kill prisoners, gorillas mating with Jewish female prisoners etc etc etc. "A fabrication repeated since the 18th century"... So people have been talking about this since two hundred years before it happened? You seem like someone who really knows what he is talking about. We should all pay attention to you. Figure out how the calendar works first. Then maybe tackle big boy topics. These pics show that the Germans weren't such bad guys after all. What a beautiful and idealist time. Imagine the possibilities if only Hitler allowed each of his staff to do what they were best at. A true leader recognizes the strengths and weaknesses of his cabinet and assigns them accordingly. Morel made things much worse. For all you deniers, Rudolf Hoess, the camp commandant himself admitted the truth. Bob, he didn't. He was tortured for many days and beaten to a pulp. His family were threatened with death or deportation into Russia. He signed a 'confession' in English a language he neither read nor spoke and in it he claimed 2.5m jews were murdered at Auschwitz. Now we know at least officially that number was less than half. So how does that validate his admission? Notice above that all revisionists or deniers as you would call them use facts, evidence and logic to support their views that the holocaust either didn't happen or has been grossly over exaggerated whereas believers who hate the thought that six million jews were not killed use abuse and zero evidence to support their abuse. Revisionist bring very good news for the jews that 6m were not murdered. The old argument used by you and yours is where did they go if they were mass murdered? The answer is very simple if you want to use your brain to work it out, or I'll tell you. The question you believers should be asking is where are the remains of 6m people if they were killed in just a few locations, because none has been shown to exist. No mass graves, no huge piles of ashes, no means even to have carried it out have ever been shown to have existed.